OK, let’s all acknowledge right up front that the smartest decision for all of us would probably be to eat fresh fruits and vegetables on Halloween. But let’s also acknowledge that handing out apples and grapes would be like putting a sign in the yard reading: PLEASE THROW EGGS AT MY HOUSE. If your diet allows for candy and other sweets, you can eat them in moderation without doing serious damage to your body. But all treats are not equal, with some containing more harmful ingredients than others. 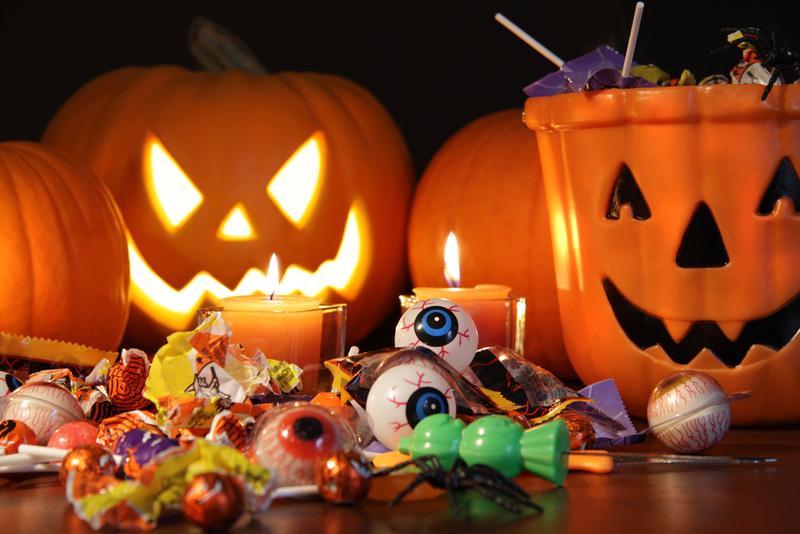 We shouldn’t call candy “healthy,” but which are the least unhealthy choices for Halloween? We scoured the Internet to compile a list of Halloween favorites that aren’t quite as scary as the ghouls and goblins knocking at your door. Researchers at the University of Nottingham found that flavanols in dark chocolate widen blood vessels and allow more oxygen-rich blood to reach the brain. This can help us feel more alert and is said to even improve eyesight. It would be a stretch to label dark chocolate as “brain food,” but this is probably the next best thing. The most obvious benefit of hard candies instead of chocolate is that hard candies take longer to eat, meaning we’re likely to eat fewer of them. Hard candies also tend to be lower in calories. On the other hand, these candies are made of sugar and not much else, so be sure to brush your teeth after eating them. Black licorice contains glycyrrhizin, a sweetener that comes from licorice root. Glycyrrhizin lowers potassium levels in the blood, which could lead to an irregular heartbeat. The Food and Drug Administration even issued an alert about black licorice several years ago, warning against eating large portions of black licorice at one time. Red licorice uses artificial flavors and sweeteners instead of glycyrrhizin, so it doesn’t carry the same health risks. And there’s not much fat in red licorice. The rice and wafers take up space in the bar, so there’s less room for fatty chocolate and sugary caramel. These kinds of chocolate bars also tend to be lower in sodium. Not surprisingly, smaller pieces of candy contain less of the same harmful ingredients found in larger pieces of candy. The trick to these treats is resisting the urge to eat twice as many of them! Halloween is nothing to fear, as long as we don’t use it as an excuse to binge on junk food. Encourage kids to see how long they can make their Halloween haul last. And maybe throw a new toothbrush into your kids’ candy bag when they’re not looking!